Posted on Sun, Jun 2, 2013 : 5:54 a.m. 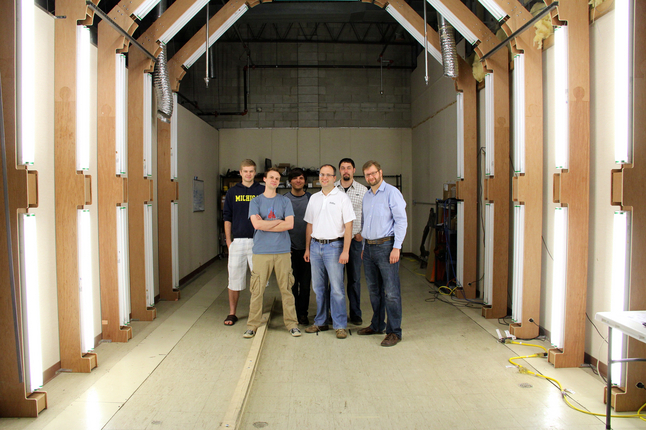 Sight Machine's Ann Arbor team (left to right: Brooks Ryba, Jim Deakins, Matthew Alto, Kurt Demaagd, Anthony Oliver, and Nathan Oostendorp) in a mock-up car inspection tunnel they built in their new workspace. As the Internet expands its reach into our lives, more physical processes are being looped into the virtual world. That transition can be tricky when innovative thinkers with new ideas run into an American manufacturing sector that slowly has been changing but still is resistant to large-scale change. Sight Machine, a company founded in Ann Arbor with an office in San Francisco, has assembled a team that can reach out to both venture capitalists and factory foremen in an effort to bridge the gap between the Internet and the assembly line. Sobel graduate from the University of Michigan Law School in 1990 and made a name for himself in Silicon Valley, holding senior positions at Yahoo! and Tesla Motors. His background with Internet companies and proven track record have helped attract the attention of venture capital firms, and Sight Machine recently closed a $5 million Series A funding round. Having lived in both worlds, Sobel is able to identify one reason West Coast entrepreneurs have had trouble bringing their ideas to major manufacturers. 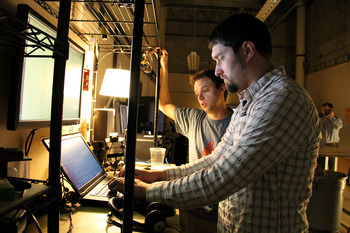 Sight Machine lead developer Jim Deakins (back left) and chief technical officer Anthony coding together at the company's Ann Arbor office. Sight Machine aims to bring a new connectivity to factories that will not disrupt what already is happening but will allow different parts of the process to talk to one another. “It used to be that all a camera sensor would do is spit out a ‘pass’ or ‘fail’ rating,” Oostendorp said. Sight Machine uses SimpleCV, an open source software developed by the company to help integrate cameras and other sensors. Oostendorp said connecting the system to the Internet makes it easier for all of the components of a system to share information with each other. “That way, a company can track where they are having issues and whether any problems along a line are related to each other,” he said. The Internet connection also allows both cameras and the software system to be updated from a central off-site source instead of manually. This streamlining can save precious hours and minutes that otherwise would take a factory offline and hamper production. The software still is under development and Sobel said the company continues to learn and develop the software as it talks to customers at factories across the Midwest. “We were careful not to rush to market but to take time listening and figuring out how our product can be useful,” he said. Madison Heights auto parts manufacturer Shannon Precision Fasteners was the first company to buy into Sight Machine’s system. Since working with Shannon, Sight Machine has begun pilot tests in five other factories including one owned by a “Big Three” automaker. Sobel said the company plans to use the new influx of capital to hire more technology and coding experts who mostly will work in Ann Arbor. The company was started in Maker Works, but moved into its own space around the corner in January. “In Ann Arbor you have enormous amounts of relatively cheap commercial real estate, a ton of talent, and proximity to the Midwestern factories we want to work with,” Oostendorp said. “To keep manufacturing here in America and here in the Midwest it needs to be a technological industry,” Oostendorp said. “It can’t just be the same old status quo." Ben Freed covers business for AnnArbor.com. You can sign up here to receive Business Review updates every week. Reach out to Ben at 734-623-2528 or email him at benfreed@annarbor.com. Follow him on twitter @BFreedinA2. Thu, Jun 20, 2013 : 7:37 p.m.
Mon, Jun 3, 2013 : 11:38 p.m.
Mon, Jun 3, 2013 : 11:40 a.m.
I&quot;m sorry, but after reading this article, I have very little idea what this company really does and how it would benefit customers. Mon, Jun 3, 2013 : 1:19 p.m.